Orange marmalade is one of the most popular preserves, and one of the easiest to make, however as with all marmalades, there are tips and tricks to get a successful outcome. For this recipe I have used navel oranges, which are highly recommended, and will give the best outcome. I also grow Seville oranges which make an excellent marmalade, and these come into season very late and well after other winter citrus, around August/September. 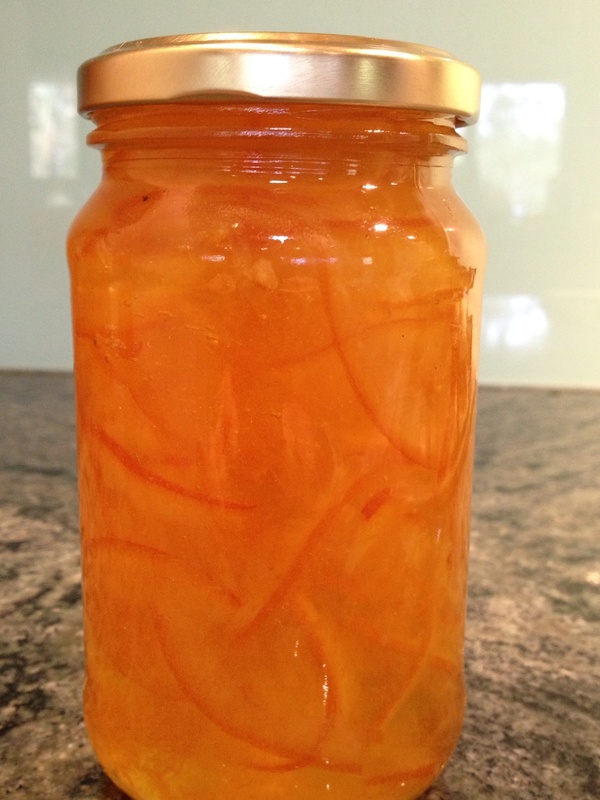 There are many different methods of making orange marmalade, and the one below is simple to follow and works consistently. For show work, some exhibitors make a jelly marmalade using the squeezed juice and very thinly sliced in very fine strips, which is very difficult to jell, but spectacular when it works and the fine strips of orange skin are suspended in the jelly. For this recipe I used five oranges, the juice of one lemon, and sugar, lots of sugar. Apart from taste, sugar is a preserving agent, and an important part of the chemical process which sets a jam, jelly or marmalade. Getting a preserve to set is a magical combination of sugar, acid and pectin, which in the right combination, and at the right temperature, sets to give jams and marmalades that distinctive texture or jell. 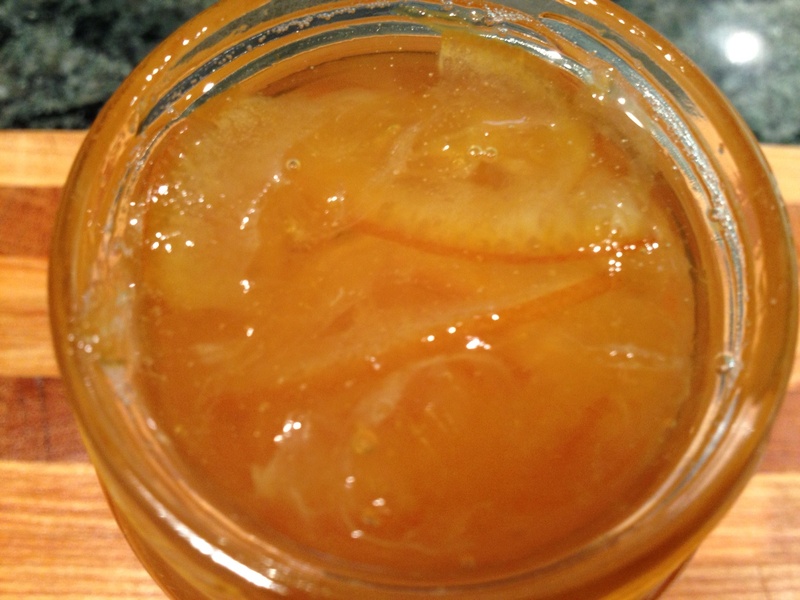 With a sweet orange marmalade, the juice of a lemon will often be necessary to provide the necessary acid. Top and tail the oranges, cut in half or quarters lengthwise, and slice the oranges as thinly as possible. Place in a bowl and cover with water. I do this by feel and experience, and there is not specific amount of water. Bear in mind that a lot of the liquid will be boiled off. 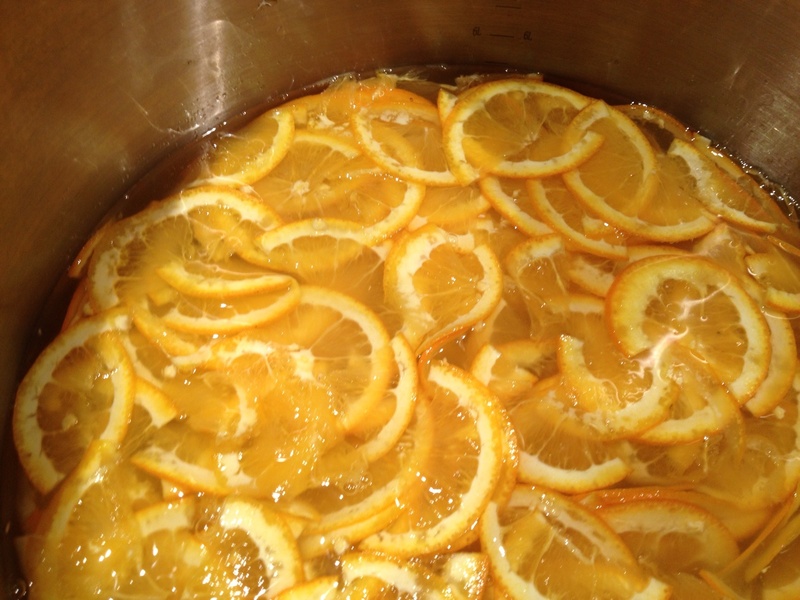 Soak the oranges in the water overnight or for at least four to five hours. If you are using oranges with seeds (naval oranges don’t normally have seeds), these need to be removed and soaked separately in a small container to remove the pectin. Strain the seeds after soaking, and add the liquid to the rest of the mixture. 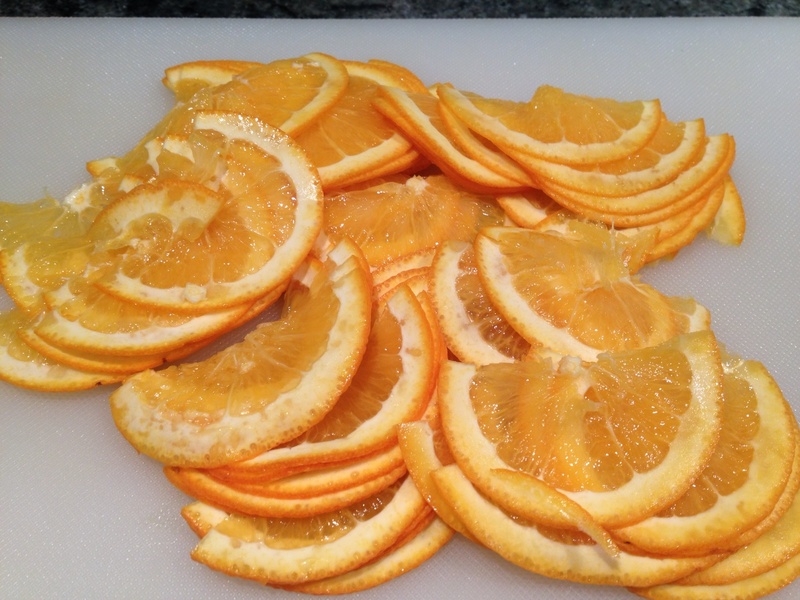 After soaking, boil the orange slices, uncovered, for one hour. This is an important step, and is needed to ensure that the orange slices will be tender. 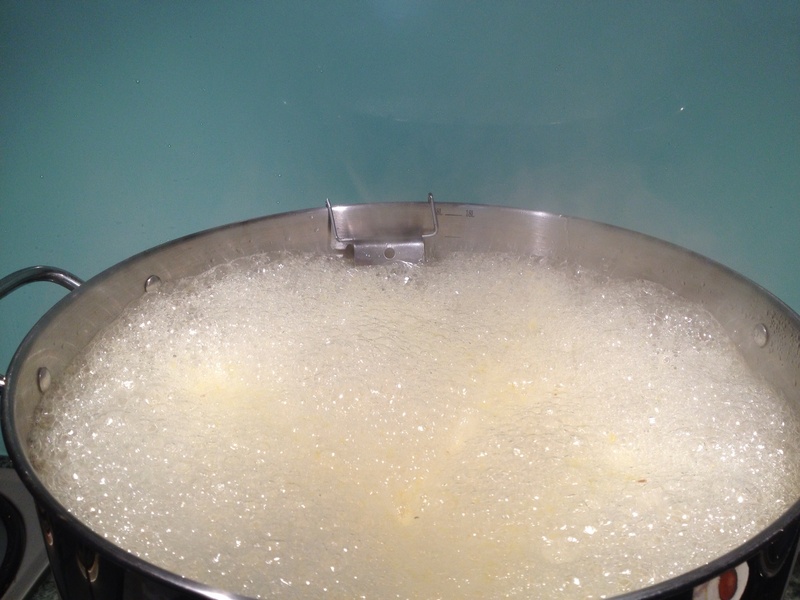 After cooking, test the mixture for pectin content, the amount of which determines the amount of sugar to be added. To do this, add one teaspoon of the cooked orange liquid to three teaspoons of methylated spirits, and tip onto a plate. If there is one big clot of the fruit mixture, you can add the sugar cup for cup. If there are smaller clots (see picture), add 3/4 sugar per cup of fruit mixture. If there are no clots, you have a problem and are unlikely to get the marmalade to set. Add more lemon than you otherwise would to give it a chance of setting. 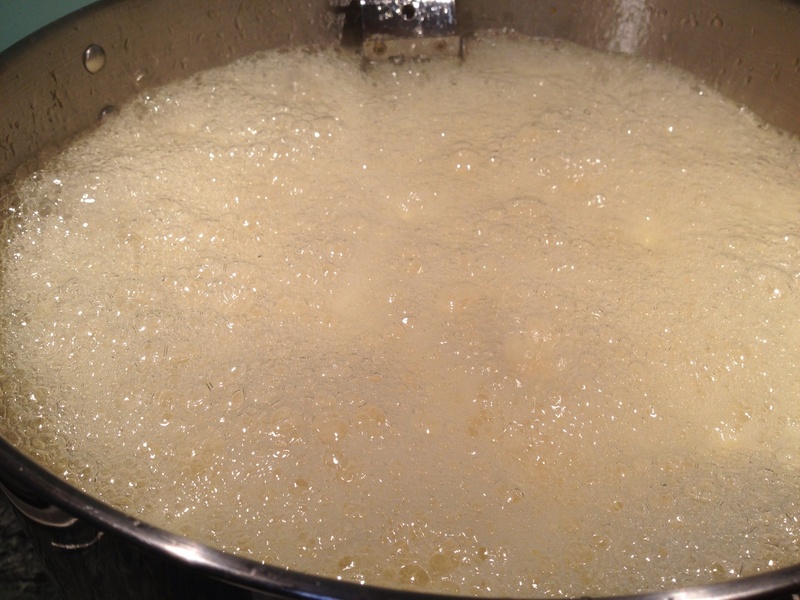 After adding the sugar, put back on the heat, but ensure that all of the sugar is fully dissolved before it boils. If you have a candy thermometer (strongly recommended), add it now. 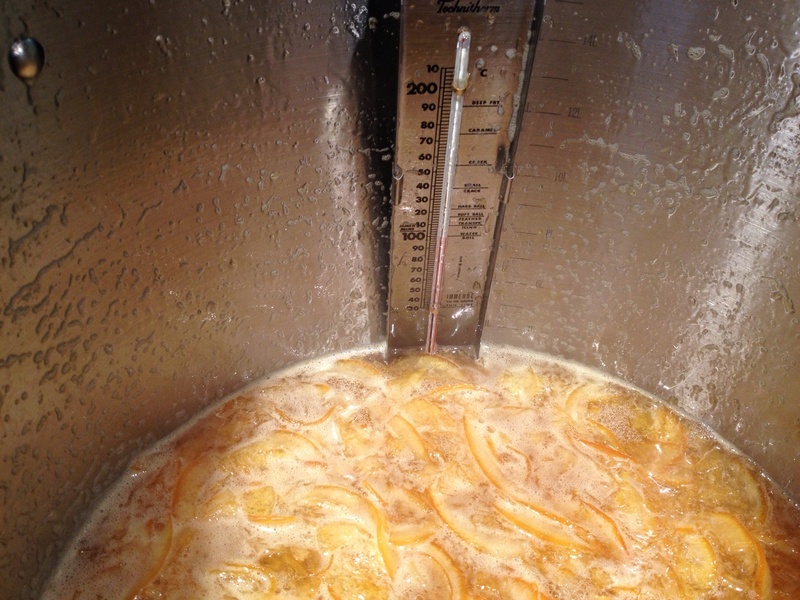 Once the sugar is dissolved, boil rapidly until the marmalade jells. This will take approximately 20 minutes. As the marmalade approaches the setting point (104 degrees Celsius), the bubbles will change and you will see a rolling boil. It will also send up the occasional spit. At this point, being testing for jelling, and also keep stirring to prevent the marmalade from sticking to the bottom and edges of the pan. Once the marmalade is set, remove from the heat, and allow to sit for 5 minutes. Pour into heated, sterilised bottles (after sterilisation, heat for 15- 20 minutes in the oven at 150 degrees), then lid immediately. Can you give some hints on bottling? Does the lid need to be sealed, as in, the safety button down? Does it need to be a new lid with no brand labels, or is a reused jar acceptable? Hi, Thanks for the question! A reused jar or lid is fine, but make sure that they are thoroughly cleaned and sterilised, preferably in the dishwasher. Labels need to be soaked off and removed. Be careful about putting jams etc in pickle and chutney jars, as the smell will continue, particularly from the lid. After bottling the preserve, put the lid on straight away and secure firmly. The safety button isn’t critical. Good luck! Thanks Geraldine, sounds like I’m on the right track. I was really worried when the button on my lid didn’t seal after I followed the sterilising process, so good to know this is not essential. I’m pleased to say that I am pretty happy with the way my marmalade has turned out, thank you for taking the time to explain the technicalities in so much detail, it really helps.